There was a great feast at Jerusalem. Jesus went down to Jerusalem because he wanted to celebrate the feast. There was a pool at Bethesda that had five porches. It was said that if anyone who is sick can have a dip in the pool when the angel stir the water, all his infirmity will leave him. So every day, many sick people including the lame, blind and paralyzed will be brought to lie beside the pool of Bethesda so that at least when the water is stirred, they have a chance to be dip in the pool and get healed. 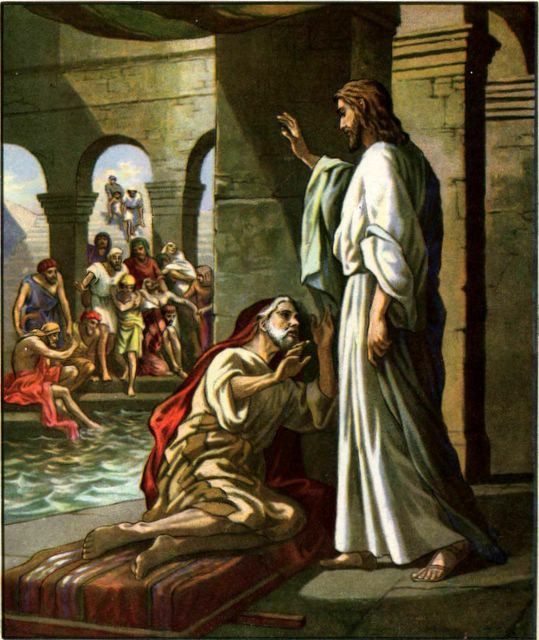 There was a paralyzed man who had been at the pool of Bethesda for 38 years. The man instantly found himself well and can walk. He picked up his mat and went home. The day that Jesus healed the paralyzed man was the Sabbath day. The man didn’t know it was Jesus who healed him because Jesus disappeared into the crowd as soon as a multitude noticed Him. The man promised Jesus that he won’t sinned anymore. Then he left Jesus and he told everyone that it was Jesus who healed him.